CD review: "Mellow Down Easy"
Carey Bell is a 30-year veteran Chicago harpist who most recently gained national attention with the release of last year's "Harp Attack" on Alligator Records. While "Harp Attack" brought Bell positive reviews and precious exposure, he still shared billing with two infinitely better-known harmonica players (James Cotton and Junior Wells) and the young Billy Branch. Further, on that all-star album, Bell never sounds as at ease an in control as he does on "Mellow Down Easy." 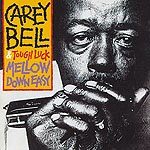 While past Bell solo efforts have toiled in relative obscurity, "Mellow Down Easy" should escape that fate. Bell, backed by a tight band (Tough Luck, out of Maryland), really shines here. His rich, sweet sound on harp and vocals lends itself well to his melodic style of playing, and an impeccable sense of timing helps swing his music. Still, he's fully capable of getting down and dirty. On "Delta Time," for instance, he evokes memories of his own Southern roots (Meridian, Miss.) while band member Lips Lackowitz lays down riffs from "Shortnin' Bread" on rhythm harp, and Bell captures the traditional sound of a freight train on the intro to his own "That Spot Right There." Bell wrote or co-wrote give of the songs here, all of which hold their own, but it is his choice of covers that betrays his exemplary taste. From Willie Dixon's "Mellow Down Easy" through W.C. Handy's "St. Louis Blues" and back to Muddy Waters' "Walkin' Thru the Park," Bell plays with an exciting combination of skill and panache that never lets the reputation of the composers overshadow his own performance. Bell is hardly the only talent here, though. Guitarist Steve Jacobs plays with taste and forethought (check out his fills on the cover of Eddie Boyd's "Five Long Years"), while bassist Brian McGregor and drummer Buddy Grandell help keep the music swinging. "Mellow Down Easy" is a welcome effort from an undeservedly under-recognized master of the blues harp.